Golden Retrievals also known as Island Retriever Rescue of the Palm Beaches (IRRPB) has been an informal operation since 2010. Golden Retrievals was incorporated in 2011 and has been approved as a not for profit 501(c) (3) organization. Long before the rescue was incorporated, animal lover and founder Linda Ripps was doing informal rescue work, fostering and rehoming displaced dogs and using her personal and enthusiasts network to help Goldens in need. Since its incorporation, our goal is to grow the Rescue into a fully-sustainable, non-profit organization with an ever-growing family of volunteers, adopters, foster homes and supporters. Our Board of Directors and volunteer team include folks with many years of experience with this breed in all different capacities. 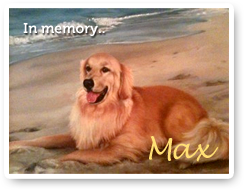 What began as the dream to memorialize the memory of her first golden, Max “Son of a Sailor” who passed away in February 2010 due to Lymphoma, is now blossoming into a rescue effort that makes a real difference in the lives of Golden Retrievers and the families that have opened up their hearts and homes.